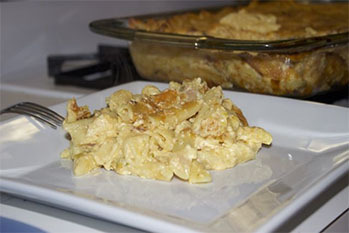 Out of the hot oven comes this freshly-baked Haitian delicacy: Macaroni au Gratin. This comfort food goes well with just about anything. Bring a large pot of water to boil over high heat. Add the pasta and let it cook until soft yet firm. Remove from heat and drain the water. Over medium heat, combine the pasta, onions and the chicken bouillon cubes. Stir in the cheddar cheese, until melted. Keep stirring constantly to avoid the cheese from sticking to the bottom. Add butter, mayonnaise and Parmesan cheese. Pour in the evaporated milk and stir. Remove from heat and pour into a greased baking sheet. Place in oven and bake for an hour or until ready.